Update: June 19, 8 a.m. Japan Standard Time - U.S. Navy identifies seven deceased USS Fitzgerald Sailors. Update: June 18, 2 p.m. Japan Standard Time - Vice Adm. Joseph Aucion, commander of U.S. 7th Fleet, held a press conference on the pier in Yokosuka to discuss the USS Fitzgerald collision. Update: June 18, 11:40 a.m. Japan Standard Time - A number of Sailors' remains that were missing have been found. As search and rescue crews gained access to the spaces that were damaged during the collision this morning, the missing Sailors were located in the flooded berthing compartments. They are currently being transferred to Naval Hospital Yokosuka where they will be identified. The families are being notified and being provided the support they need during this difficult time. The names of the Sailors will be released after all notifications are made. Update: June 17, 9:15 p.m. Japan Standard Time - USS Fitzgerald, aided by tug boats, returned to Yokosuka. PHILIPPINE SEA - Search and rescue efforts continue by U.S. and Japanese aircraft and surface vessels in the hopes of recovering the seven USS Fitzgerald (DDG 62) Sailors still unaccounted for after the ship was involved in a collision with the Philippine-flagged merchant vessel ACX Crystal at approximately 2:30 a.m. local time, June 17, while operating about 56 nautical miles southwest of Yokosuka, Japan. "Right now we are focused on two things: the safety of the ship and the well-being of the Sailors," said Adm. Scott Swift, commander of the U.S. Pacific Fleet. "We thank our Japanese partners for their assistance." The collision effected Fitzgerald's forward starboard side above and below the water line, causing significant damage and associated flooding to two berthing spaces, a machinery space, and the radio room, which damage control teams quickly began dewatering. While those efforts helped stabilize the flooding, it remains uncertain how long it will take to gain access to the spaces once the ship is pier side in Yokosuka in order to methodically continue the search for the missing. Once the ship arrives in Yokosuka, divers will inspect the damage and develop a plan for repairs and inspection of the spaces. As of this time, there have been three patients requiring medical evacuation. One was Cmdr. Bryce Benson, Fitzgerald's commanding officer, who was transferred to U.S. Naval Hospital Yokosuka by a Japanese Maritime Self-Defense Force (JMSDF) helicopter. The other two personnel were medevac'd from Fitzgerald to USNH-Yokosuka by Helicopter Sea Combat Squadron (HSC) 12 for lacerations and bruises. All three Sailors are awake and will remain under observation at the hospital until further notice. Other injured are being assessed aboard the ship. Interested family should call DSN at: 315-243-1728, 1729, 1730, 1731, 1731, 1732, 1733, 1734, 1735 or Commercial at: +81-46-816-1728, 1729, 1730, 1731, 1731, 1732, 1733, 1734, 1735. 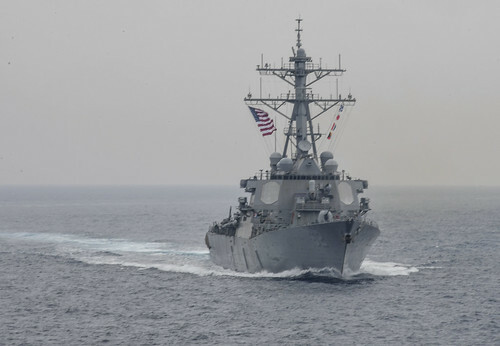 For continuing updates visit http://www.c7f.navy.mil/, and follow https://twitter.com/us7thfleet or https://www.facebook.com/7thfleet.